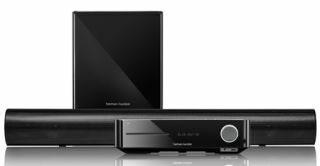 IFA 2011: Harman Kardon delivers Blu-ray home cinema in style | What Hi-Fi? Harman Kardon has upgraded its BDS range of Blu-ray-based home cinema systems, adding 3D support, enhanced connectivity and a wider selection of models - now including 2.1, 5.1 and soundbar packages. The new Harman Kardon range is based around two Blu-ray receiver units: the BDS-270, which powers the 2.1 packages, and the 5.1-channel BDS-570 (pictured above; it also features EzSet/EQ auto surround-sound set-up). Both head units feature 3D support and 65W-per-channel of power. Each are also available separately, if you wish to add speakers of your own choice. The black-gloss finish comes as standard; a white-lacquer finish is on its way. Connectivity has also been boosted with the addition of three HDMI inputs - allowing you to connect up a range of sources, such as games consoles. Audio Return Channel support enables you to give your TV sound a boost, whle a front-mounted USB socket enables playback of music. The entry-level, 2.1 BDS-370 packages pairs the BDS-270 unit with HKTS 2 virtual surround loudspeakers (also available in white), while the step-up BDS-470 adds the slightly bigger HKTS 200 2.1 speaker package. Moving up to systems paired with the BDS-570 receiver, the most interesting new addition is the soundbar-based BDS-670 (pictured above), which can be upgraded to 5.1 by adding a pair of HKTS 30SAT rear speakers. The new range is rounded out by three full 5.1 systems. The BDS-770 features a dedicated centre speaker and four compact satellites; the BDS-776W offers a similar set up except with white-finish speakers. Topping the range is the BDS-870 (pictured below) - a 5.1 system using the larger, HKTS 60 5.1 speaker system. All six systems are expected in shops from next month. UK pricing hasn't yet been set, but the Euro figures give a good indication of what you'd expect to pay. The BDS-270 Blu-ray receiver costs €899, while the BDS-570 is priced €999. The BDS-370 system comes in at €1049, with its white-speaker BDS-370W version slightly pricier at €1099. The BDS-470 and soundbar-based BDS-670 both cost €1149. The BDS-770 package is priced €1399, with a premium for the white-speaker BDS-776W, which costs €1499. The flagship BDS-870 is €1599. We hope to review several models from the new Harman Kardon range as they become available; we'll also bring you pictures of that white-gloss finish as they appear.